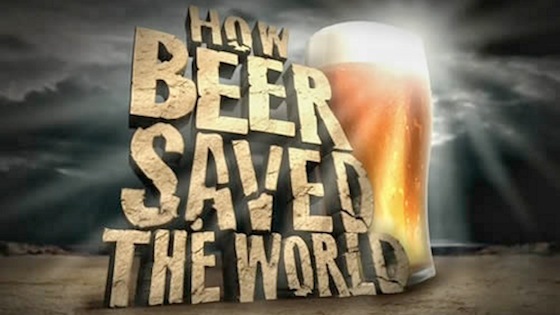 Continuing with my documentary series of 2012, tonight I watched the Discovery Channel’s “How Beer Saved The World“. I knew that beer was consumed in the middle ages because water wasn’t always necessarily safe to drink, and that some of our founding fathers were home-brewers, and of course if a pirate isn’t drinking rum, he’s drinking mead or ale of some kind … but I never knew so many fascinating facts about beer until watching this film. ~ People point to the agricultural revolution involving barley grown for bread, but evidence suggests that barley was actually being cultivated 3,000 years before bread was being made. It was being cultivated to make neolithic beer. ~ The first written language “Cuneiform” had a word for beer, and it’s everywhere in the ancient dictionaries or “word lists”. One of the most important word lists found has over 160 different words related to beer. That’s more than the eskimos have for “snow”. ~ Egyptians used beer as currency, and pyramid builders were paid 1 gallon of beer a day. It would have taken 231,414,717 gallons of beer to build the pyramid of Giza. Everyone drank beer – not so much for the alcoholic content, (this beer was only about 3% alcohol) but for nutrients in it. ~ Tetracyclene was found in Egyptian bones from 3,000 years ago, and scientists couldn’t understand why this modern antibiotic (first documented in 1945) was so prevalent in the Egyptians. Researchers brewed beer according to an ancient Egyptian recipe and the result was rich in Tetracyclene. Modern day antibiotics themselves weren’t developed until 1928. ~ Beer was often consumed instead of water because it was safe to drink while not all water sources were safe. What made the beer safe to drink? The boiling process. Early peoples didn’t know this was the reason, but they did know that beer was good. It was brought on long voyages because even “safe” water would spoil over time. It kept the settlers alive on the Mayflower. They were headed for Virginia, but actually ran out of beer so they ended up landing at Plymouth Rock – a place they deemed suitable for brewing more beer. ~ America’s National Anthem melody was borrowed from a men’s social club anthem, which was storied to be a drinking song. ~ Louis Pasteur, the famous French scientist remembered for his remarkable breakthroughs in the causes and preventions of diseases, and the father of “germ theory“, was studying beer (not milk), and why it sometimes spoiled. ~ While there were designs for refrigeration systems as early as 1748, Lager arrived in the US in the 1840’s from Germany. Lager is cold brewed, and that had to done with ice, so at the time brewers were only able to make it in cold seasons. So brewers poured money into refrigeration research. The Cold Ammonia machine was the first commercial refrigeration machine made in 1881, and it was made for beer. If you like beer, or history, for that matter, you should watch this documentary. It’s a lot of fun, but also very educational. Some of the claims made in it are a bit of a stretch, but all of the little known facts about beer really are surprising. And of course, the experience is not at all dampened with the addition of a frosty beverage.